Teachers in the NYC Department of Education — and I imagine in general — are not allowed to accept gifts from individual students unless they are of sentimental or small financial value. (I wonder if teachers can create a SuperPAC?) And I admit that I occasionally lust after the idea of a yearly bonus or even a decent bottle of champagne as a you-survived-another-year-gesture from the Chancellor. But I also wish that 100% of my students would submit their work 100% of the time after giving 100% of their effort. As a teacher, I’ve learned I can’t always get what I want. But last week I did. Let me first back up to early fall, when I was tutoring my student, Roger*. In addition to having him in my senior English class, I met with him to work on his college applications and like many of my tutoring sessions, ours often ended with discussions about food. Roger and his family come from China and his dad cooks in a restaurant in Manhattan’s Chinatown so we talked often about how well he must eat at home. I often asked him what he brought for lunch or what he looked forward to for dinner. I hounded him for tips on secret spices or the best grocers. 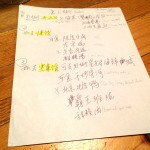 I bugged him for the names of dishes they serve only to Chinese-speaking customers at his father’s restaurant. I wanted poor Roger to unlock the secrets to our city’s Chinatown, the one that is only accessible to those in the know. I stood with my nose pressed up to the window of a great meal and I wanted in. Last week my seniors submitted the final drafts of their research papers and though Roger had already added his to the class pile, I noticed him scribbling at his desk. With my best Larry David stare, I caught his attention and he approached my desk with a piece of paper in his hand. In the top right corner it said, “Ms. 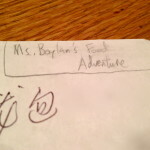 Boylan’s Food Adventure” and below was a list written entirely in Chinese characters. Some were highlighted and some were starred. I was giddy with intrigue. And there it is. The best gift a teacher could receive is a treasure map! Maybe I’ll take my EatNYC kids on the adventure with me. But only one question remains: how will I write the DOE permission slip? *The name of the student is changed. ← The Kid Stays in the Kitchen: Zhi Ming Caramelizes Ribs! The Kid Stays in the Kitchen: Galit Roasts the Turkey! The Kid Stays in the Kitchen: Sam Rocks Beef Stew! The Kid Stays in the Kitchen: Zhi Ming Caramelizes Ribs!